Currently the lightest-ever Sony single-lens reflex camera at about a pound, the A230 is a little light on features at first glance. Aimed squarely at beginners, this 10.2-megapixel SLR has a retro-look on-screen help guide through its 2.7-inch LCD, illustrating the effects, for example, of adjusting shutter speed and aperture. The camera automatically focuses when it detects an eye coming level with its viewfinder. The quick and efficient A230 allows new users to point and shoot to begin with, before progressing to its quartet of creative modes and six scene options. As a further aid, turn the camera on its side to shoot and its LCD display will likewise flip through 90 degrees. It saves images either to SD/SDHC cards or Memory Stick; you simply flicking a switch to choose between them. The small handgrip is annoying, especially given the big buttons and chunky controls. It’s usable but uncomfortable compared to the full-size versions found on rival models. The A230 has no Live View option, which is a shame, as this would have made the camera even more user-friendly. An unexpected-but-welcome features are the sensor-shifting SteadyShot Inside image stabilization, and an HDMI-out port for hooking up to an high-definition TV. However, there’s no video and and HDMI cable costs extra. Sony does, however, feature its D-Range (Dynamic Range) Optimizer technology (found on cameras higher up the range) for otherwise tricky exposures, such as shooting against a bright light that would usually render foregrounds dark and devoid of detail. The camera kit includes an adequate 18mm to 55mm lens. The kit lens is also impressively sharp given ideal shooting conditions, displaying minimal barrel distortion and corner softening at maximum wide angle. If you're on a budget, the A230 is one of the most affordable SLR kits around. The A230 may be less sophisticated than other models, but that’s not necessarily a bad thing given its target market. It’s a good starter option for those on a budget who aren’t already wedded to another camera's lens system. 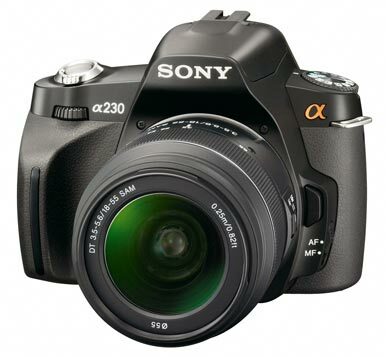 This story, "Sony A230" was originally published by Macworld U.K..